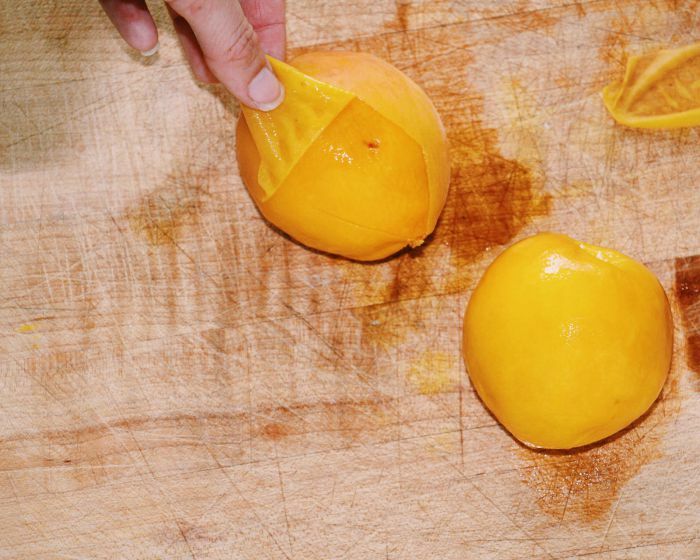 If you have a peach tree, or access to reasonably priced peaches (hit up the farmers market), then chances are you are going to want NEED to know how to peel a peach. 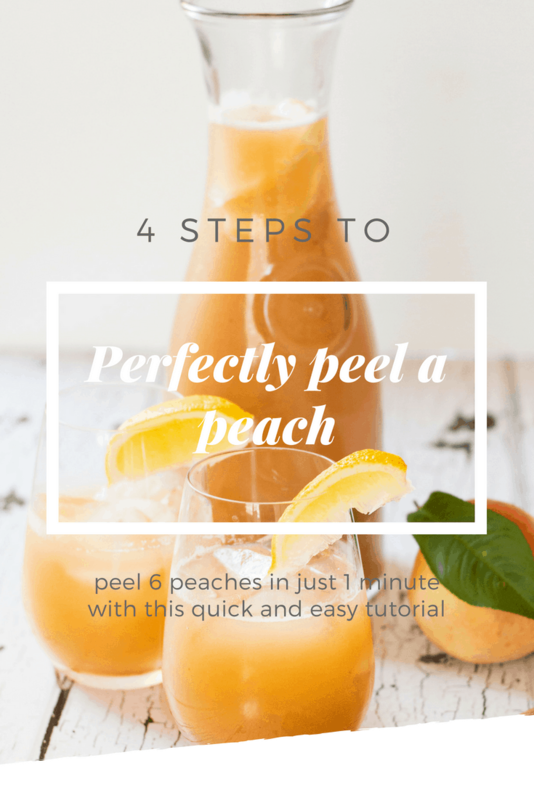 Make it quick and easy with this simple tutorial on the best way to peel a peach, and get a big batch done in no time. This recipe has been updated from the original August 2015 version in order to provide a better experience for our readers. 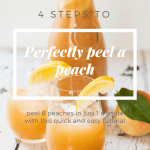 This recipe is a bit of a doozy, but this method for how to peel a peach has totally changed my life so I just had to share with you. I recently had 200 peaches ripen on my tree within 3 days, so I had to preserve as many as possible in as little time as possible, before the squirrels chewed them all up. This my friends meant that I spent an entire afternoon peeling 200 peaches…Not the most fun you can have with a blunt stick, but setting up a little production line, and getting the littles involved, made it so much quicker (note: I lie – the toddler definitely did not make it quicker). Just in case you too have to peel 200 peaches I thought it only nice to share this quick and easy method with you to make the whole process as stress free as can be. Why Will I Need to Peel a Peach? 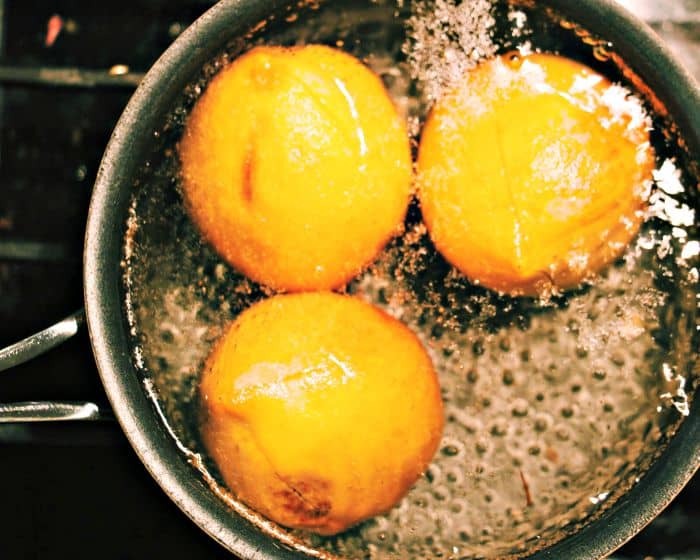 A lot of recipes will call for peeled peaches to give you a smoother result. Also, if you want to can your peaches or you want a nice smooth peach butter, then a peeled peach is going to be key. Sometimes peaches can have a bitter skin, or be super fuzzy, in which case you are going to want to enjoy them naked. Our peaches are homegrown and have a pretty thick, chewy skin, which I just don’t enjoy, so I find it better to just peel them and enjoy the yumminess inside. What Do I Do With My Freshly Peeled Peaches? 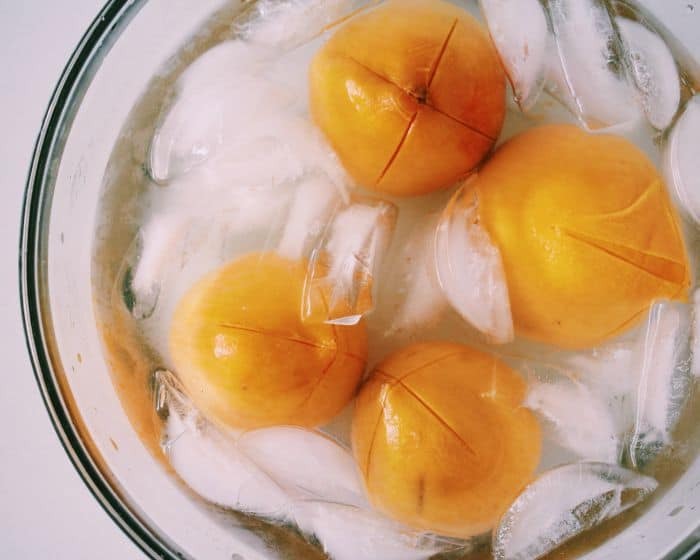 Whip up some Fresh Peach and Honey Lemonade. Haha not surprising for me, although when I first inherited my nectarine tree it would have been a different story! I’ve used this trick to peel tomatoes before, but I’ve never peeled a peach! Also I am incredibly jealous of your peach tree 😀 And I love peaches- I should plant a peach tree of my own!!! 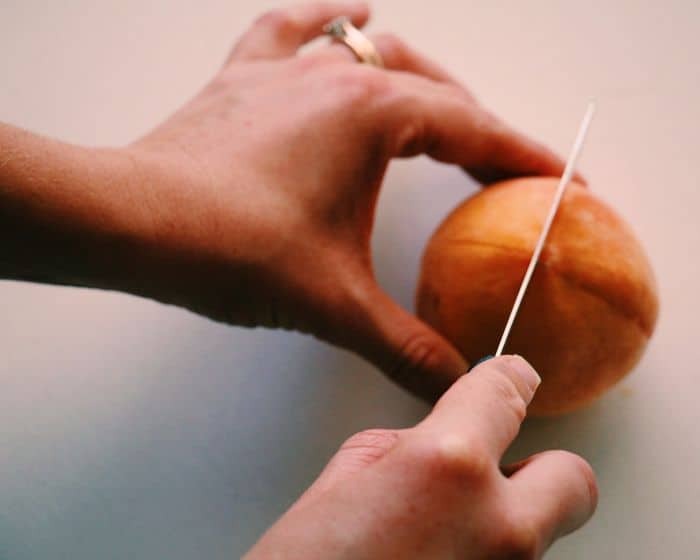 This is a wonderful tutorial and the right way to cut a peach. This is exactly how they teach you at culinary school! I love peaches and they are so plentiful and sweet right now so I will be making all things peaches!!! I love this tutorial! It’s so handy and I’m totally using it to make peach jam this summer with allllll the peaches! They are my favorite fruit and it’s so awesome to be able to peel them so quickly and easily! That’s genius!!!!! I have long given up and would just cut off chunks where I couldn’t peel it with a knife. It was never a round peach after I was done with it LOL. This method is just perfect for getting the skins off easily! You are so lucky to have a peach tree. Sometimes we get peaches when they are plentiful at the Farmer’s Market. I used to can peaches and make peach preserves. I remember I used to do the same thing as you do. Excellent tips. It was so long ago I’d forgotten. I know, it was part of the reason we bought our house – so many beautiful established fruit trees!! Haha I know right, it was pretty much the only reason we bought our house – established peach and nectarine trees – so lovely! We’ve got peaches! This looks like such a refreshing way to use them! Such a handy wee post! I swear not enough people know how to do this! What a great post. Peaches can be such a PITA to peel (along with hard boiled eggs). I will have to give this handy little trick a try next time I pick up a basket of fresh peaches at the market. Haha, I still hate peeling hard boiled eggs – I swear I have tried every trick under the sun and they still end up a mess every time! Great tip! I’ve learned that lots of commercial peaches actually have the fuzz removed before you even buy them. But, I love the one’s from the farmer’s market that are super juicy and fuzzy so this is great to know. Thanks! I had no idea they did this with commercial peaches, I will have to have a look next time i am at the supermarket! The ones at the farmers market are so good though, I definitely cant go back to buying the supermarket versions! Thank you so much for this hack! Definitely going to try it out — love peaches!! Had a good laugh reading your post Donna…Sorry! I use this method to peel tomatos! However it never crossed my mind to apply it for peeling peaches. Great idea! I use it for my tomatoes as well 🙂 I am glad I was able to give you a laugh! You may think this is random, but it is such timely advice for me! I’ve been needing to figure out how to quickly peel peaches for this recipe I want to make. I remember seeing something similar to this on Martha Stewart years ago and had forgotten the exact method. This will definitely speed up the peeling process, thanks so much for sharing!